Swype was really the first replacement keyboard for Android that Droid owners could show off to their snarky, iPhone-wielding pals to make them a just a little jealous. Today it's getting better. The update brings a few nice improvements to the original sliding keyboard, the biggest of which are App Gestures. Highlight some text, then slide from the Swype-Key to the T to the W, and it'll open Twitter and have the text all ready for you to Tweet. You can do the same thing with an address from a text message, but have it open in Google Maps. There are also shortcuts for cut, copy, paste, and select all. Spiffy. 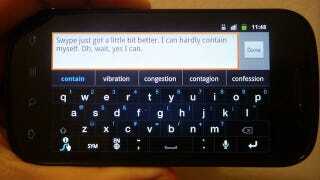 Aside from that there's improved personal dictionary management and the auto-capitalization of proper nouns. Truth be told, this isn't rewriting the game, here. It's an incremental update, and I'm not 100% sure why they're making such a big deal out of it. Regardless, Swype has gotten a lot better over the last year and is certainly more usable and accurate than it once was. Sprint Nexus S 4G owners will be able to grab this update for free at 9am EST from sprint.swype.com. Everyone else will have to wait a bit, I guess.